In Holding Police Accountable, nine of todays leading scholars on police work examine seminal research on the use of force and how it can inform today's research. The volume celebrates the late James J. Fyfe, the preeminent scholar on police use of force. In 1978 Fyfe found that administrative controls—training, guidelines, and regulation—reduced deadly shootings by officers without adversely affecting law enforcement or crime rates. The finding not only had profound impact on firearms policy, but compelled police departments to cooperate with independent researchers. Here, the scholars pick up the torch to work toward effective yet fair policing that will better protect all Americans. 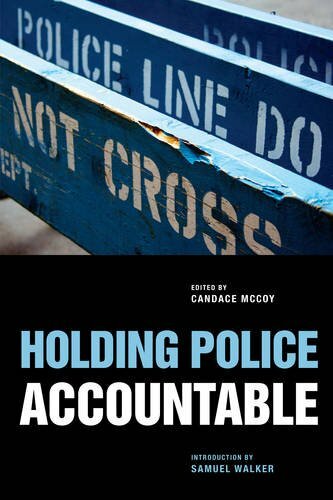 In Holding Police Accountable, nine leading scholars of police work examine seminal studies on the use of force and consider how they can inform today’s research. The volume celebrates the late James J. Fyfe, the preeminent scholar on police use of force. In 1978, Fyfe found that administrative controls--training, guidelines, and regulation--reduced deadly shootings by officers without adversely affecting police safety or crime rates. The finding not only had profound impact on firearms policy, but also compelled police departments to cooperate with independent researchers. The writers in Holding Police Accountable pick up the torch to work toward effective yet fair policing that will better protect all Americans. Candace McCoy holds an appointment at the Graduate Center of the City University of New York and teaches in the doctoral program of the John Jay College of Criminal Justice. In 2009, she was an exchange scholar with Britain's National Police Improvement Agency in Bramshill, England. She has received the American Society of Criminology's Herbert Block Award for distinguished service to the profession.